If you need a device to bring to a golf tournament and don’t want to go through the hassle of getting it certified, you can easily bet on something like the TecTecTec VPRO500S as a solution that’s ready and waiting for you. 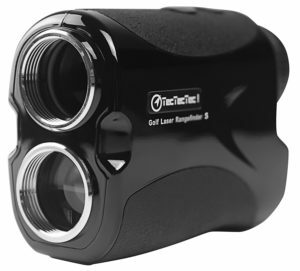 It comes at a moderate price that’s noticeably higher than that of some competing models on the market, but at the same time, this is one of the best laser rangefinders you can arm yourself with if you want to get the upper hand in your play. Its range goes up to 540 yards and can provide you with extremely accurate measurements in this area. The company is known for their PinSensor technology, which is also featured here, along with their slope estimated distance mode. The combination of the two features should be enough to give you the most precise mode of operation you can get from a rangefinder in this price class, and you can expect all your measurements to be much more accurate than what you’d get from most other similar devices. We were particularly impressed with the quality of the lenses, as their special coating makes the picture clearer and more readable without compromising any of the information. You’ll still see exactly where everything is, but some objects might be more defined thanks to the altered contrast. This can make a huge difference in a situation where your ball fell in a more difficult area, such as one with lots of foliage that might be obstructing your view. Even though this is a golfing rangefinder and not a hunting one, it’s still designed with a very sturdy body that can take a lot of abuse, and you should never have to worry about the device giving up on you in a difficult moment. Just make sure you use it with all special equipment provided in the package, as TecTecTec have gone out of their way to ensure that your investment can last a long time.